Lundstram and Forshaw came through the Everton youth set-up together and could line up against each other when Oxford go to Middlesbrough in Saturday's FA Cup fifth-round tie. With Boro in danger of relegation from the Premier League, Aitor Karanka could make changes, but Lundstram hopes Forshaw is in the opposition line-up. "At the same time he's a top, top player, so if he doesn't play I won't be too disappointed." The pair have been in Whatsapp communication since the draw for the last 16, a stage Oxford reached for the first time since 1993-94 by beating Newcastle 3-0. If Michael Appleton's men can beat Boro in front of more than 3,000 visiting fans at the Riverside Stadium, it would be Oxford's best FA Cup run in 53 years. With non-League Lincoln and Sutton occupying attention, Oxford's progress has gone relatively unnoticed, but they have cup pedigree and last season knocked Swansea out. "We've gone under the radar, so that's probably a good thing for us," Lundstram added. "If one of the other smaller clubs go through, you never know, we could even nick a couple more rounds. "There's belief in the camp, so hopefully we can do something." Two more wins would secure a place in a Wembley semi-final. Oxford have another possible route to the national stadium - in the Chekatrade Trophy if they beat Luton in the semi-final. Oxford were beaten by Barnsley. The 22-year-old added: "It's a long, long, long way off but we can all dream can't we? "Miracles happen, Leicester won the league last year so you never know. "For me to play at Wembley in any competition will be a massively proud moment. It would be something I'd cherish forever. "I played with Leyton Orient a couple of years ago in the play-off final. But if it is to be this season, I will lead the lads out there and it'll be even better." 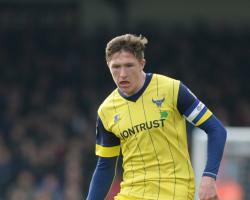 Oxford's cup progress has led to fixture congestion in League One, where a play-off push is not out of the question. They are seven points adrift of the play-off places, with games in hand, after losing to Southend on Tuesday night, ending a run of five straight wins, and would rather not have a replay. "We have a lot of games coming up so we'd rather win on the day," Lundstram added. "We have a lot of belief in the camp and hope we can go there and do the business."